NEW ORLEANS — Seven juveniles arrested in a string of armed robberies. A 13-year-old accused of trying to carjack an undercover state trooper Uptown last April. A group of kids as young as nine terrorizing the Bywater and Marigny with brazen burglaries and robberies. In December, three teens were arrested in a carjacking that took the life of a pastor's wife, Jeannot Plessy. One was 15. 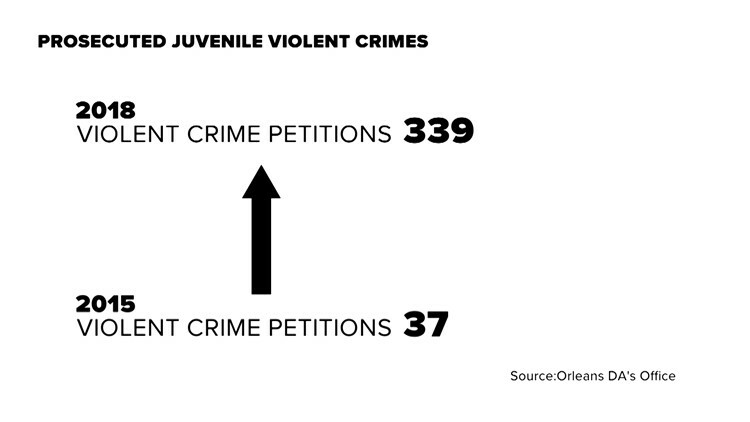 The spike in juvenile violent crime in New Orleans isn't just anecdotal. Statistics obtained exclusively by WWL-TV reveal the harsh reality: Violent crime by juvenile offenders isn’t just on the rise, it’s hitting record levels. 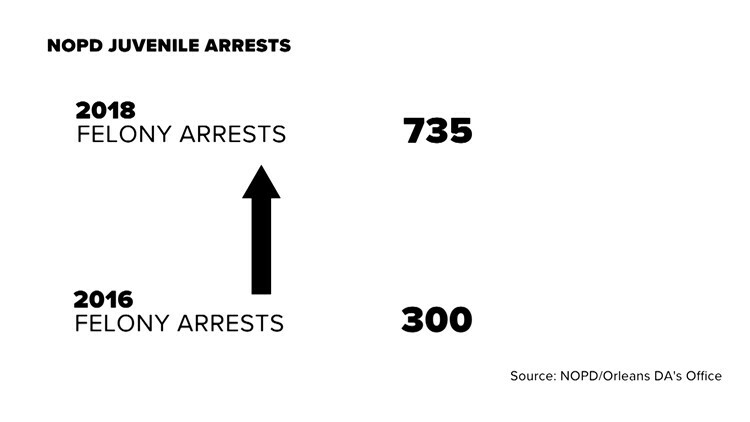 Juvenile felony arrests in New Orleans have more than doubled in three years, from 300 in 2016 to 735 last year. Inside those numbers there is an even more troubling trend. Juvenile violent crimes prosecuted by the DA's office – shootings, armed robberies and sexual assaults – jumped nearly 10-fold since 2015, spiking from 37 cases in 2015 to 339 last year, according to statistic compiled by Orleans Parish Juvenile Court. Suspects arrested before they turn 17 are handled at the new Juvenile Justice Center, which houses Juvenile Court and the Youth Study Center, a 48-bed detention facility that usually houses two to three dozen youngsters at any given time. Because of privacy laws covering juveniles, information about individual cases is difficult to come by. But aggregate statistics show a troubling picture. The spike in juveniles arrested in violent crimes comes amid an overall increase in youngsters arrested in all crimes, from 786 total arrests in 2016 to 1,232 arrests in 2018. District Attorney Leon Cannizzaro recently called the trend “the biggest local crime issue” in 2019. The spike in juvenile crime is something of a dark lining in the silver cloud of overall declines in violent crime in New Orleans, with murders in 2018 hitting a 47-year low of 146. Shootings and armed robberies also dropped by double-digit percentages from the previous year. But violent crime involving juveniles is bucking the trend. And it comes as the city is following a national trend by embracing major reforms in the juvenile justice system, detaining fewer youthful offenders in favor of counseling and other alternative programs. While juvenile case files aren’t open to the public, court proceedings in juvenile crimes of violence are. WWL-TV sat in on court hearings in the some of the most serious violent crimes handled by the court. On Jan. 9, three juveniles – two 15, one 16 – were arrested after an armed robbery in Algiers in which the attackers forced the victim to lie on the ground. After taking money and jewelry, the robbers then pistol-whipped the victim in the face. At a detention hearing, prosecutor Niki Roberts added one more alarming detail: The crime took place just hours after two of the suspects had been released from juvenile court following a gun arrest about a week earlier. “What's the definition of insanity? Trying the same thing over and over again and expecting a different result,” said Brandt, who left the DA’s office in January after spending 20 years handing cases in juvenile court. One accused repeat juvenile offender is now facing serious charges in state court, charges stemming from a spree of violence just weeks after he turned 17 years old. As a juvenile, Yasean Upton was accused in a string of armed robberies and at least one burglary in the university area of Uptown. His juvenile cases were followed closely by a woman whose niece was a victim of one of the armed robberies. The woman herself became a victim a short time later when Upton was booked with burglarizing her vehicle. “He's been caught numerous times on school mornings in my neighborhood committing crimes with a gun,” the woman said. The woman, who did not want to be identified out of fear, went to juvenile court to sound alarms about Upton, hoping to get justice for her family and help for her attacker. “He's a child. Who is supposed to be monitoring him?” she asked. Clerk of Orleans Juvenile Court Ronard Darensburg acknowledges the increase in cases of violence, but argues that detaining offenders only leads to more crime in the long run. “How do we deal with the wave, or the increase in juvenile crime in this city? I think that what we not do is build jails, but instead use those resources to strengthen families,” Darensburg said. Aaron Clark-Rizzio is the director of the Louisiana Center for Children's Rights, the public defender's office for juveniles in New Orleans. He points to studies that show rehabilitation produces better long-term results than detention. While the surge in juvenile violence is fueling a get-tough position by prosecutors, youth advocates are pushing a very different approach. Clark-Rizzio and Darensburg point out that even if given a maximum sentence for a juvenile crime, the longest a youthful offender can be held is until the turn 21. “When we use overly punitive policies and punishments, when we incarcerate and detain young people, yeah, we shouldn't be surprised that the behavior's not changing,” Clark-Rizzio said. “We are not going to be able to detain ourselves out of crime,” Darensburg said. Cannizzaro said he agrees that juveniles have a greater capacity for change if exposed to the right programs, but he points to the volume of repeat offenders being handled by his office to argue that those programs aren’t working in New Orleans.